Reverse Osmosis Filters – A sure path to great drinking water! The principals of reverse osmosis have been known and understood for hundreds of years, yet many of us are unaware what they are and how filters based on this technology work. Recent advances in materials ensure that RO filters can cost effectively be used even in small systems intended for in-home use. In recent years the technology has developed to the point where it is widely available and extremely useful as a means of removing significant levels of a broad range of unsafe water contaminants. Reverse Osmosis technology exists on the scale of industrial plants that take salt water and create drinking water right down to systems like MineralPro’s that can be installed under your sink or other convenient home locations. Although Reverse Osmosis (RO) seems like a complex system, it is a simple and straightforward water filtration process. High-pressure (pump driven) reverse osmosis systems have been used for years to desalinate water – to convert brackish or seawater to drinking water. With the advent of high quality but low-cost membrane technology, quality RO systems such as MineralPro’s can run off the standard home water pressure with no pump required and filter out a wide range of dissolved inorganic pollutants. When combined with other types of filters such as are included with the MineralPro RO System, a well-designed RO Filter system removes a significant amount of the chemicals and particles that are common in many drinking water supplies. This includes dissolved chemicals such as chlorine, arsenic and lead, bacteria, parasite’s, most viruses and even things like pharmaceutical drugs and hormones that get into drinking water supplies and are not filtered out by standard municipal treatments. Having a better understanding of how a reverse osmosis system works will eliminate the mystery and confusion you may feel when you look at a reverse osmosis system — with its many coloured tubes and multitude of filters. In home systems, Reverse Osmosis (RO) is a process in which dissolved inorganic solids (such as salts) are removed from a solution (such as water). This is accomplished by household water pressure pushing the tap water through a semi-permeable membrane. The membrane, which is about as thick as cellophane, allows only the water to pass through, not the impurities or contaminates. These impurities and contaminates are them flushed from the RO cartridge and depart as dirty water down the drain. The design of the co-filtration portions of the water treatment system.Particle filtration removes particles of 1 µm (3.9×10−5in) or larger. Microfiltration removes particles of 50 nm or larger. Ultrafiltration removes particles of roughly 3 nm or larger. Nanofiltration removes particles of 1 nm or larger. Reverse osmosis is in the final category of membrane filtration, hyperfiltration, and removes particles larger than 0.1 nm. 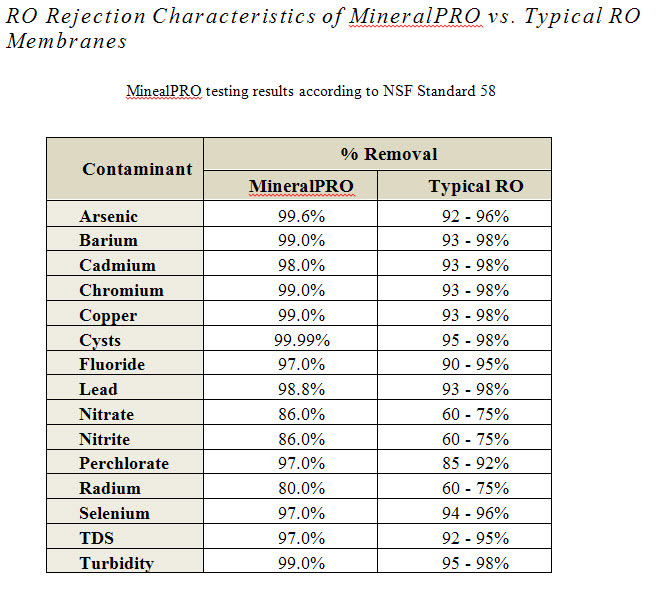 MineralPRO’s reverse osmosis membrane will remove impurities and particles larger than 1/10,000th (0.0001) microns. What Chemicals does a Reverse Osmosis Filter Remove? 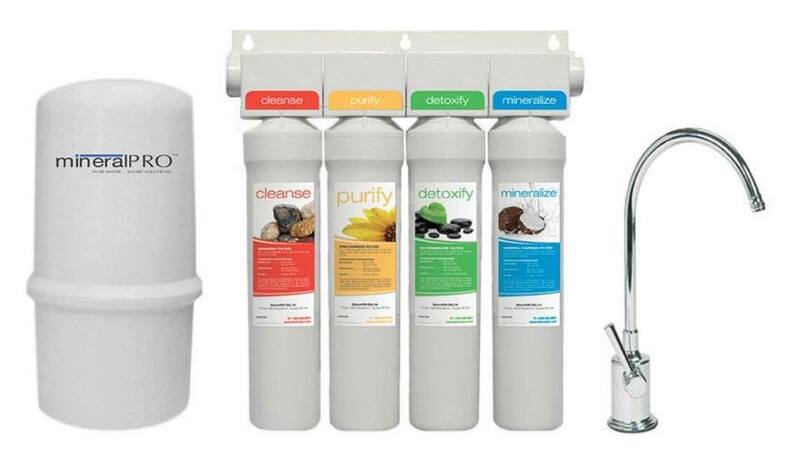 It is critical to differentiate between the individual process of reverse osmosis and carbon absorption and the unique synergy represented by the complete MineralPRO drinking water treatment system which integrates the two mutually beneficial technologies – membrane separation and activated carbon filtration. Carbon plays an integral role in the complete MineralPRO drinking water system. Activated carbon is a form of elemental carbon whose particles have a large surface area with high adsorptive qualities, primarily used to remove objectionable tastes and odours and numerous toxic, organic compounds from water. Adsorption is defined as the adhesion of a gas, vapour or dissolved organic compound on the surface of activated carbon. A particle of carbon has an extremely large surface area owing to its structure of pores similar to those found in a sponge. Due to this texture, a single teaspoon of activated carbon will have a surface area equal to a football field. Unlike a sponge that will absorb water containing taste and odour and then when squeezed, releases water with these constituents still present, activated carbon adsorbs or engulfs such constituents causing them to adhere to the surface of the carbon thus effectively removing them from the water. The ability of activated carbon to adsorb organic chemical contaminants, like VOCs, THMs and chloramines, is dependent on the amount of contact time as determined by the flow rate as well as the porosity of the carbon involved. By way of an example, the mineralized water travels through the coconut husk post-carbon filter at the rate it is dispensed from the faucet, at approximately 0.5 gpm. At this flow rate, the coconut husk carbon is only able to remove tastes and odours that might be present. Pretreatment is important when working with reverse osmosis and nanofiltration membranes due to the nature of their spiral-wound design. The material is engineered in such a fashion as to allow only one-way flow through the system. Since accumulated material cannot be removed from the membrane surface systems, they are highly susceptible to fouling (loss of production capacity). Therefore, pretreatment is a necessity for any reverse osmosis or Nano filtration system. Why is a MineralPro Reverse Osmosis System the best choice for drinking water? 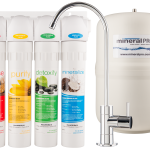 The Mineral Pro System not only produces very pure water but has the advantage of the benefits that the added minerals offer to your health and in the best tasting water you can get! Most people love the taste of our water which in turn results in them drinking more than they did before having our system. Many people fill containers to take our water with them to work or on trips. After the pure water is produced the water is stored in the pressure tank in the pure form ( un-mineralised) and when the RO faucet is opened the water flows out from the tank and through the last stage of our system which has the natural minerals in the final cartridge. This guarantees that our water is always produced fresh on demand and will never have a stale taste. When the water flows through this stage the natural minerals get absorbed into the water in a natural process similar to water flowing down a mountain stream. The final component is the highest quality carbon which is made from Coconut husks which put a final polish on the water, resulting in the best tasting water you will find! This is what makes our system not only unique in the industry but provides our customers with the best choice in a quality filtering system!